LOWER EAST SIDE — For Jessi Green, 28, the difficulty of giving up sugar came to a head when she started crying in a Thai restaurant. In her first week on a no-sugar diet, Green thought for sure she'd find something to eat at the Southeast Asian eatery. But as she scanned the menu of noodle and stir fry dishes, she realized there was nothing she could order that didn't come doused in sugar-laden sauce. "I had a full-on tantrum," said Green, a social media consultant who blogged about the journey to break her sugar addiction. "I didn't think I was capable of crying over something like that." She left the restaurant, and went on to survive a 12-week sugar detox program that triggered blistering headaches and intense cravings. Now, Green — who rarely indulges in sugar — can say no to sweet things. Many New Yorkers are considering banishing sugar in all its forms — from the obvious sugar in desserts and candy, to the hidden sugar added to sauces and dressings. Also included are the sugars that the body produces on its own when it digests carbohydrates like bread. In a city so accustomed to ordering in, eating out or eating on the run, quitting sugar can seem like a social death sentence. But experts say there's a glimmer of hope for New Yorkers — as forgoing sugar here can be easier than anywhere else. "It is so much easier to be sugar-free in New York City, and that is because we have a lot of foods that don't contain sugar," said Dana James, a food coach and cognitive behavioral therapist. While the city offers many temptations, it is equally rich in quality low-sugar options catering to educated consumers. There's a host of creative restaurateurs who are also concerned with healthy eating, according to James. This means you don't have to avoid your friends and colleagues while you avoid sugar, she said. Nick Wilber, the head chef at farm-to-table restaurant the East Pole on the Upper East Side, said diners seeking less sugar were part of the broader locavore trend, in which consumers aim to know the origins of their food. "I never add sugar to anything, even strawberries," Wilber said. Wilber said the first rule for sugar-averse diners is to think about the quality of the raw ingredients that a restaurant is using. Restaurants that begin with poor quality food often head down a path of adding more sugar to cover up the taste. That can include surprising sugar additions, including blanching unripe peas to make them taste naturally sweet. "If [ingredients] are good and in season you don't need to add anything," he said. 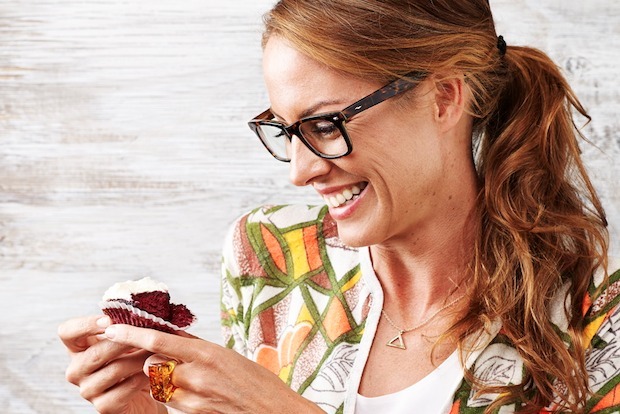 Farm-to-table restaurants can offer the best selection of low-sugar meals, according to Sarah Wilson, who is launching her eight-week eating plan "I Quit Sugar" in New York in April. "People take pride in the original ingredients and they don't cover it in really terrible [sugary] sauces," she said, suggesting Rosemary's in Greenwich Village, ABC Kitchen above Union Square or Dig Inn, which has several locations in the city. Japanese, Greek and Paleo restaurants such as Hu Kitchen also have low-sugar options, Wilson said. Sauces, dressings and glazes are often a den of hidden sugar, according to James and Wilson. "Ask for sauce on the side — they will always contain a little sugar," said James. "Then you can ration it yourself." The less complicated a dish, the less sugar it will likely have, such as sea bass and broccoli rabe or a steak and salad, advised James. Use a chai or herbal tea to distract you when dessert time comes, Wilson advised. What to Do About Alcohol? One magnet for hidden sugars can be alcohol: not only the spirits, but the mixers, experts warn. The good news for sugar quitters is one or two glasses of wine will not send you back into an addiction, Wilson and James said. White spirits such as tequila and vodka are low in sugar, but the danger comes with some mixers, such as tonic water. Wilson suggested ordering cocktails without the sugar and bringing your own liquid stevia, an herbal sweetener, to add yourself. Christine Young, 47, a client of James', cut sugar out completely for about three months to kill her addiction. During that time she would meet a friend for dinner instead of just drinks, in order to better avoid sugar. The only time Young turned down invitations was when she felt weak during the detox time, she said. "I now have the mental freedom to make the choice," she said. "I have freedom and peace around sugar." Despite all the packaged foods that are a haven for added sugar, delis do have low-sugar options. Dark chocolate with about 85 percent cocoa is actually low enough in sugar to not be a problem, according to James and Wilson. Nuts, cheese, coconut water, some beef jerkies or "a small chicken and salad," suggested Wilson, are good snacking options.